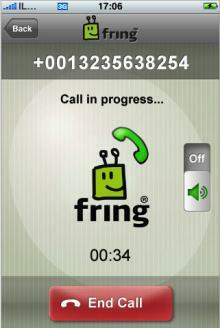 Fring has released the iPhone version of their service today as a free download in the App Store. Steve Jobs had said that VoIP calls over Wi-Fi was allowable in the App Store when the iPhone SDK was first released. Fring should also work with the new iPod touch, which supports an external microphone. Update 2: This YouTube video demos using Fring on an iPod Touch to call a cell phone for free. This Video walks through how it is accomplished.